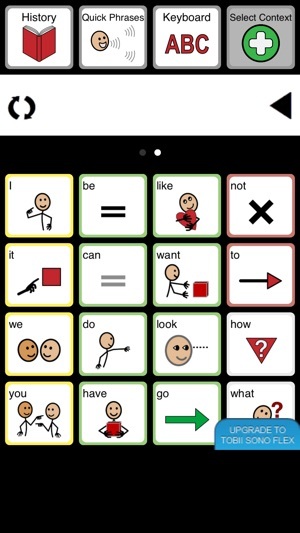 Tobii Sono Flex is an easy to use AAC vocabulary app that turns symbols into clear speech. 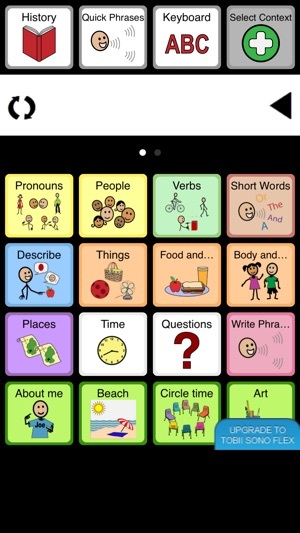 It offers language to nonverbal users who are not yet in full control of literacy. Sono Flex combines the benefits of structure and flexibility, providing a framework for language development, quickly matching individual and situational communication needs. Tobii Sono Flex has been designed to be easy to operate and easy for SLPs, teachers, parents, caregivers or other communication partners to setup and customize. 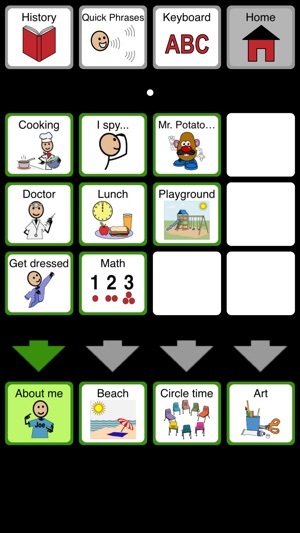 Tobii Sono Flex is a universal application available for iPhone, iPod and iPad. Users need only to buy the application once to run it on either device. Tobii Sono Flex is also available in a slightly limited, but fully functioning evaluation version called Tobii Sono Flex Lite. Educational institutions are eligible for a 50% Educational Discounts through Apple’s Volume Licensing Program for Education when buying more than 20 licenses (currently only available in the USA). Please contact your local Tobii representative for more information. - Comes with 5 US English, high quality Acapela voices; one boy, one girl, two women and one male voice. - Tobii Sono Flex is available for iPhone, iPod, iPad and on regular PCs and dedicated speech devices running Tobii Communicator. "Awesome, awesome, awesome! I wonder why it hasn’t been developed before. It is great to have the situational modules at hand so easily. This is just perfect for us to prepare sessions with clients with a minimum of time consumption. 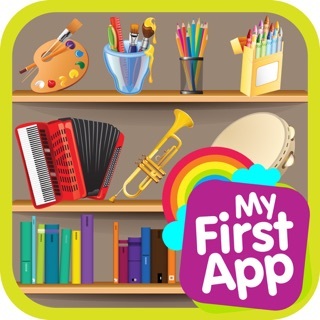 It is really nice that you have chosen very interactive and playful contexts that are age independent." "I have to say, I really like Sono Flex. I believe that the control that a user has over it is going to be very helpful and prove to be successful over other currently available products where one can just flip through screens without having access to a full communication system that supports interaction. I really love the Context-based pages. It is great that you include phrases in these as well for quick interactions that are specific to the context-based pages. Glad to see About Me as a context page. The way you can swap out context-based pages is really brilliant and helps to expand the communication opportunities without increasing the navigation demands." "Looks good. I like the way the vocab is laid out and you can change one bottom bar it’s possibly the fastest way of changing vocab I have seen." "I love the vocabulary and the mix of core words and situations. What I like: Layout of pages; no vertical scroll; grammar feature; situations, situations, situations. Editing is very different, but once I got used to it I liked it (I like to see the whole page as a list, that is cool)."